The Rolling Stones were the last thing I expected to see in a documentary about Ramón Mercader, the man who killed Russian revolutionary León Trotsky. But Ramón is remembered today for only one thing, sinking an ice ax into the back of León Troksky’s head. Storm the Skies was made for Spanish Television, and it’s creators probably assumed that the Spanish audience would be well versed in the history of the Spanish Civil War and European history of the 20th Century in general... or at least better versed than an American audience. So it moves along at a fast pace, not pausing to explain events. But even if you don’t know all the details, this is a great story, the kind of thing that has to be true, because you can’t make it up. The story of Ramón’s life was unknown to me and seeing this documentary was quite an education. It’s a first rate doc and whatever minor problems it might have are more than made up for with a wealth of information, interviews and inside stories. But why include the Rolling Stones? As the narrator says, it’s an arc across history, so let me work my way back and forth through this story line. The Stones’ performance helped break an informal cultural embargo imposed on Spain that had held since the Spanish Civil War ended in 1939. That was when the Nationalists, led by Gen. Franco and backed by Hitler’s Germany, had defeated the Republican Loyalists. The Spanish Republicans had been backed by the Communists, which at that time meant the Soviet Union, which in turn meant Joseph Stalin. In the 30’s, Stalin had seized control of what was left of the Russian revolution and jealously exiled León Trotsky from the USSR. Trotsky was Lenin’s probable heir and is often credited with engineering the success of the 1917 Russian revolution. From his exile, Trotsky continued to criticize Stalin’s management of the international Communist cause. From Stalin’s point of view there could only be one ‘offical’ version of Communism and that was his version. Communism was the direct cause of the rise of Fascism and the European wars that began with the Spanish Civil War and ended with World War II. But Spain had remained officially neutral during WWII and so afterwards, it found itself alone and shunned as the only remaining Fascist country in Europe. With the decline and death of Franco and a gradual liberalizing of the government, artists like Spanish cellist Pablo Casals and even the Rolling Stones could perform in Spain once again. So could this be what all the sound and fury of the 20th century added up to? A prance by Mick and the boys? Talk about your Honky-tonk blues. Getting back Ramón’s story... the thing about assassins is that they become the ‘Man Who Killed So-And-So.’ Only rarely is anything known about the assassin himself. (For instance, there is Bob Ford. Who, you say? You know, the guy who shot Jesse James.... oh, THAT Bob Ford!) And so it is for Ramón Mercader, the man who assassinated León Trotsky. But there’s a twist to this story in that Trotsky, who is as historically important as anyone in the 20th Century, was an ‘un-person’ in the Soviet Union and the West for more than 70 years, an enemy to orthodox Communism and capitalism alike. So the name ‘Ramón Mercader’ isn’t going to be the household word that a John Wilkes Booth, Lee Harvey Oswald or James Earl Ray are. If little is generally known about León Trotsky, even less is known about his killer. On this point, Storm the Skies has a lot of territory to cover. However before you can understand Ramón, you must first know about Caridad, his mother. Here Storm the Skies strays a bit from the subject of Ramón’s life. It is a necessary detour because Caridad del Rio Mercader is herself just too interesting and integral to the puzzle of Ramón to gloss over. This important digression works against Storm the Skies because the viewer has come to the film enticed by the infamous assassination only to find himself inexplicably immersed in the Caridad’s extraordinary and bohemian life in Barcelona of the early 1900’s. If it seems confusing, bear with the narrative. It will make sense eventually. Caridad’s story goes something like this: she was born into a comfortable aristocratic life in 19th Century Spanish Cuba. Her family returned to Spain where she was raised to be a proper lady, married the son of a factory owner and had four children. But she gave it all up to become a revolutionary firebrand — a route that is often taken by the children of well-to-do parents at the beginning of a revolution. She became an ardent Communist and Soviet loyalist, and remained so until her death in the 1970’s. She raised her children to be Communists as well. She must have done a good job because it’s the dedication to The Cause that propels her son Ramón along in his life. He was born in Barcelona in 1914 but grew up in France after Caridad left her husband. Ramón was raised to be a dedicated Communist, which means he was also an ardent antifascist. When the Second Spanish Republic was declared and the Nationalists attempted to return the monarchy by force, naturally he was going to be right at the front, fighting for the Republic Loyalists. But in the middle of the war, Ramón, now a young man and an officer, was sent to the Soviet Union along with his younger brothers and sisters. The children went (along with thousands of other Spanish children) to be saved from the dangers of the civil war. But for Ramón there were other plans. In a plot right out of Ian Fleming, the Soviets trained Ramón for a mission to spy on and eventually kill León Trotsky. There is a strange parallel here too with The Manchurian Candidate where the scheming mother points her assassin son at her targeted victim. And now I wonder if Richard Condon, the author of The Manchurian Candidate, was aware of the story behind Caridad and Ramón Mercader. 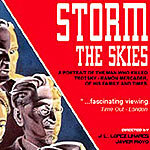 Storm the Skies does a very good job in describing the intricate and time-consuming trajectory Ramón takes from Moscow to Paris to New York City and finally to Mexico City and the home of exiled León Trotsky. People with first-hand knowledge of the event are interviewed all along the way. The murder is committed and Ramón then spends the next 20 years in a Mexican jail without comment or anyone ever knowing his real name or who sent him to kill Trotsky. It was only towards the end of his sentence that his true identity is discovered. When he was released from prison in 1960 he went directly to Cuba where he was warmly received by Castro. Soon he made his way back to Moscow where he was awarded the Hero of the Soviet Union medal, perhaps the most prestigious award given by the USSR. He then spent the rest of his life living quietly in the USSR and Cuba, where he died in 1976. His ashes were returned and interred in Moscow. Assassinations usually result in outcomes unanticipated by the assassin. Indeed they are often the exact opposite of what they intended. (How much different the Southern Reconstruction might have been had the Confederate sympathizer John Wilkes Booth not shot Abraham Lincoln.) So too with Ramón Mercader a man who dedicated his life to the Communist cause yet who killed the one person who might have guided it through the Stalinist detour. Caridad and Ramón chose to stay the course with Stalin and his version of the Soviet Union as the one true champion of Communism. Did Ramón have any regrets later in life? He never said, but he was often quoted as saying the scream Trotsky let out when struck with the ice ax stayed with him for the rest of his life. I wonder, now that the USSR passes further into history, if the political pressure in the West to ignore Trotsky might lessen and this story of dedication and treachery might gain a wider audience. If so, Storm the Skies will be a sought-after resource... even if the appearance of the Rolling Stones may leave you scratching your head. The only “extras” are English subtitles and scene selection. The English language subtitle selection failed to work on one of my computers, but worked on the other and worked on my DVD player. This may be a random thing or possible bug. I thought he menu engineering needed a little help. It would have been helpful if the DVD had included some program notes for American audiences to brush up on their 20th century history. Visually, this DVD is solid, and the soundtrack is wonderfully Spanish; it’s a delight to hear. It would have been nice to see more info on the artists heard on the soundtrack. Don’t be put off by the seemingly random beginning... it’s all going to work out in the end. And it gets better the second time around.